Maggy and her mom, Leah. NorthBay Guild volunteer Shahane Everett is happy to report that the little girl she befriended during a trip to Kenya in 2010 has had a successful surgery on both of her legs and is recovering nicely. Shahane, 20, met Maggy, then 5, and her mother Leah during a three-week volunteer stint in Kenya, where Shahane worked at a school for special needs children, and later at an orphanage. Maggy really captured her heart, says Shahane. Despite all her maladies, Maggy always had a smile on her face. When she was only 8 months old, Maggy became ill with meningitis. Although she survived, it left her with permanent nerve damage on her left side. Her foot was curved around and her leg could not bear weight. When Shahane returned home, she decided she wanted to do something to make a difference in Maggy’s life, so she embarked on a fund-raising campaign to help pay for the cost of the surgery. 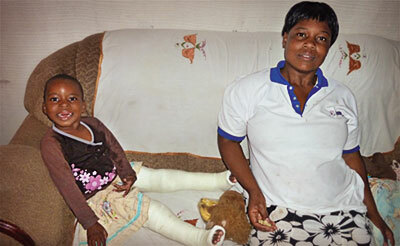 Doctors in Kenya determined that the surgery on her leg would cost about $550. Shahane shared Maggy’s story in local newspapers and in Wellspring, and the outpouring from residents was tremendous. The college student—who hopes some day to become a doctor— raised enough money to pay for the surgery, and help Maggy with some of her other needs.